Ludwig van Beethoven (English IPA: /ˈlʊdvɪg væn ˈbeɪtoʊvən/; German pronunciation: [ˈluːtvɪç fan ˈbeːthoːfn], 16 December 1770 – 26 March 1827) was a German composer and pianist. He was a crucial figure in the transitional period between the Classical and Romantic eras in Western classical music, and remains one of the most respected and influential composers of all time. 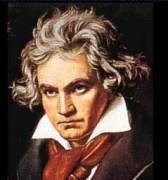 * Beethoven composed all 9 symphonies between 1799 and 1824. * He studied under Haydn for less than a year in 1793. * In 1801, he wrote a letter to his friend about his loss of hearing.